With total combined land area of unit I & II around 8 acres, we have over 2 lac sq.ft. of shed area. We have a processed, chained system where raw material once fed comes out as a finished product. Over 50 cranes are deployed ensuring smooth streamlined production. PEPL has Messer (Germany) make CNC cutting machine with cutting width of 3350 mm (track width of 4100mm) and cutting length of 20000mm (track length 24000mm). The machine has 1 nos. Oxyfuel gas cutting torch and 1 nos. HPR 130 plasma cutting torch. The machine can be programmed with drawings and then automatically a cutting plan is generated giving utmost accuracy. PEPL has state of the art In-house 900 Tons 12.6 Mtrs Long CNC Hydraulic Press Brake. 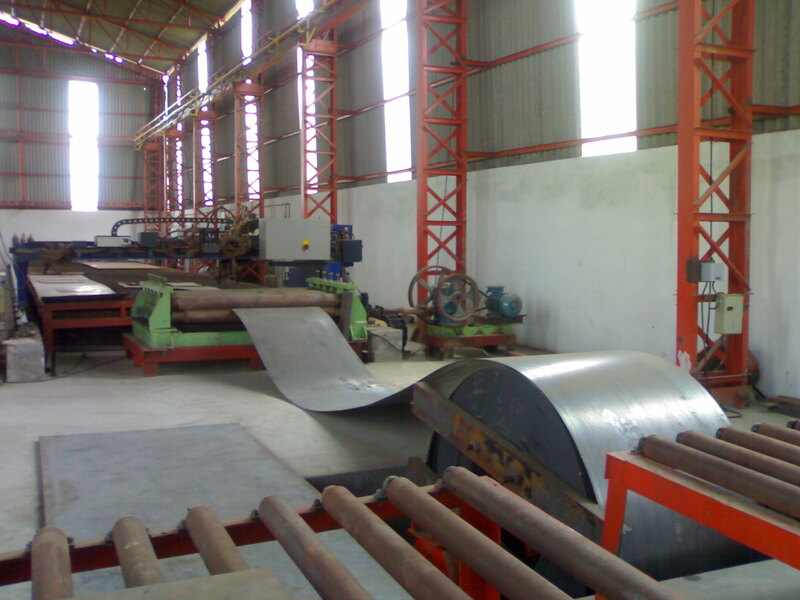 The position of the press beam is continuously monitored by measuring system. 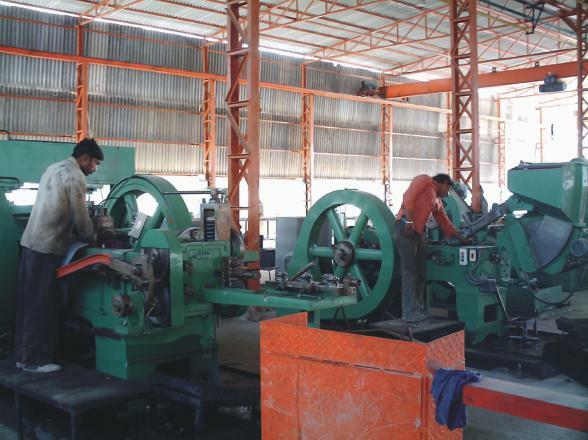 Machine can be adapted to different type of tool design for Octagonal & Conical Poles. Machine offers press beam depth accuracy of ±0.01 mm with high repeatability. We have two nos. CNC Welding machines. The machines are programmable to automatically close the Pole gap with servo controlled hydraulic pressure. Welding process used is Submerged Arc Welding (SAW). 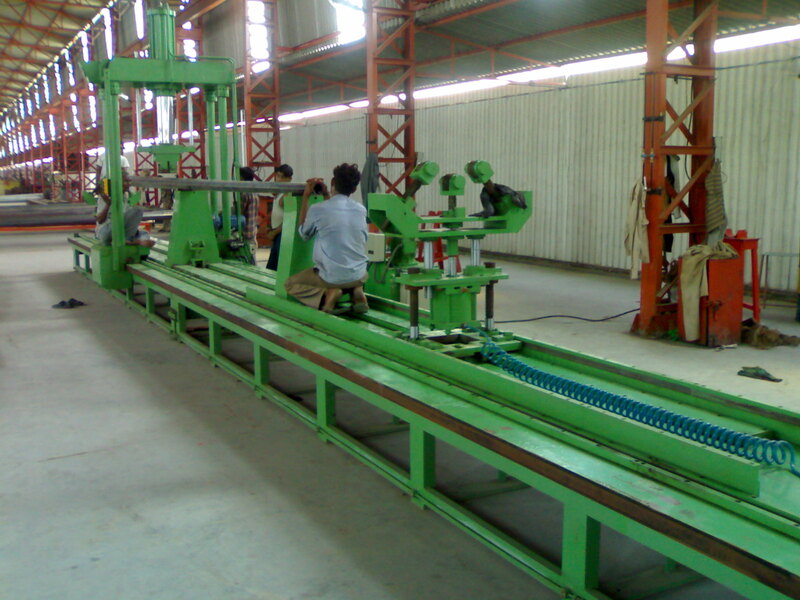 PEPL has 50 tons Hydraulic Straightening Press which has over head 4-pillar structure guided with horizontal & vertical roller which guides on bed frame & moves along full length of pole. Hydraulic cylinder mounted on 4-pillar structure is operated by geared motor & direction control valve & two pneumatic floating cylinder which holds the taper Pole. “Highway Safety Division” of PEPL is involved into manufacturing of Highway Guardrail. We have in-house facility for manufacturing of “W” beam like cutting, punching, roll forming, galvanizing & quality assurance testing with laboratory to meet stringent customer requirements. PEPL manufacture “W” beam highway guardrail according to AASHTO “M”-180 and “MORTH” specification. “Hardware Division” of PEPL is producing high quality nuts and bolts for its customers in Telecommunications, Power Transmission and Road Safety sectors with single target of total TQM. PEPL has the most advanced high temperature hot dip galvanizing ceramic bath furnace for accurate and smooth coating. Having 4 nos. of most Modern Galvanizing Plants, creating a Galvanizing capacity of 5000 tons of materials per month. We specialize in Galvanizing through a 7 tanks process. Material is galvanized as per IS 2629 and BS-729.